My iPhone must have overheard the conversation I had with my husband when he declared, “You need to find a different razor. $20 for 3 blades is ridiculous!” (Agreed.) 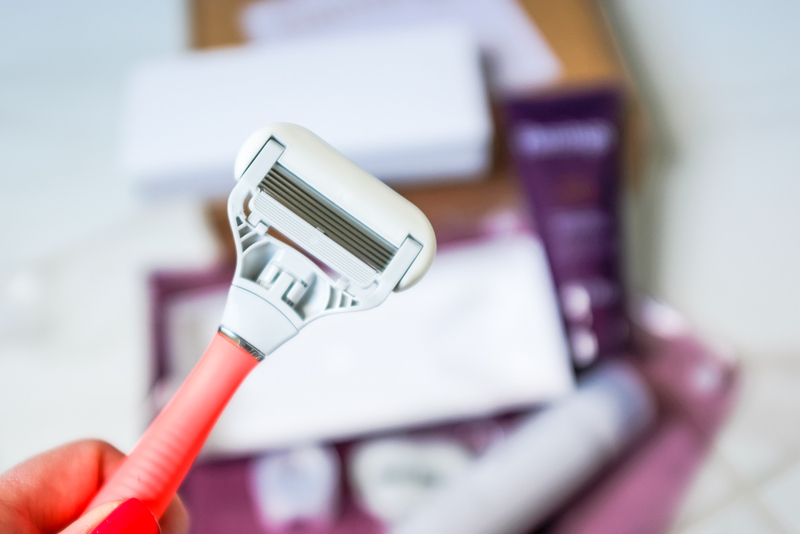 So commenced the search for the best razor for women. Almost immediately, ads for razors started popping up online. About the Good Taste Community – Each week, we ask our community members a few questions and share the responses in our blog posts. Real women. Real responses. Real recommendations. Then, we share our reviews + recommendations for work and the weekend from our community each week in a newsletter. Join us! We asked: What’s your favorite razor? Yes, I tested all three. Flamingo on my left leg and Dollar Shave Club on my right leg, for several days. Then I found out about My Billie and added another into the mix. (My husband thinks I’m bonkers.) Here’s the rundown on the three. 95 years!! 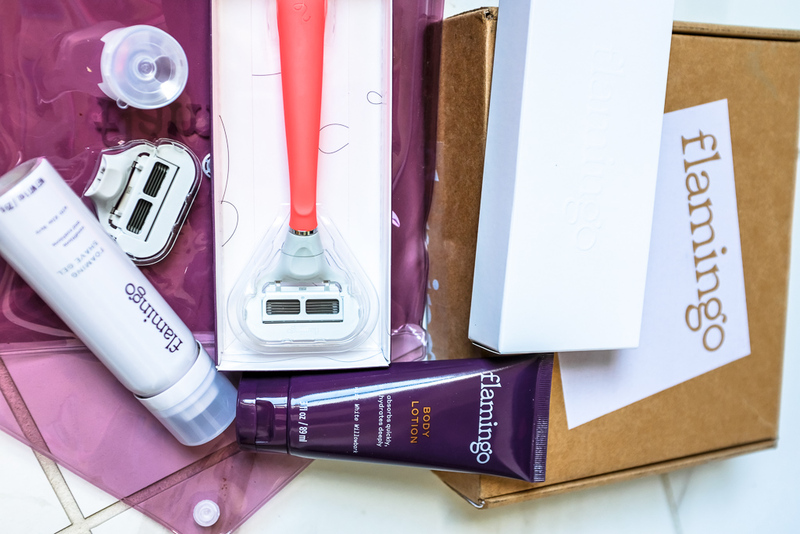 This must be a fete of shaving engineering, so I plunked down* $16 for the shave kit which includes the razor, an extra cartridge, lotion, foaming shave gel, and a purple travel bag wrapped up in a cute box. Plus, you have several color options for the razor. I chose coral, which turned out to be more florescent than coral, but it’s a bright pop of color against the white subway tile in my shower. The razor is light but has a nice grip, and the shave is smooth. I did not have razor burn, yippee! Dollar Shave Club sucked me in with a quick video of a woman shaving her leg in the shower and the offer of a $5 shave kit. 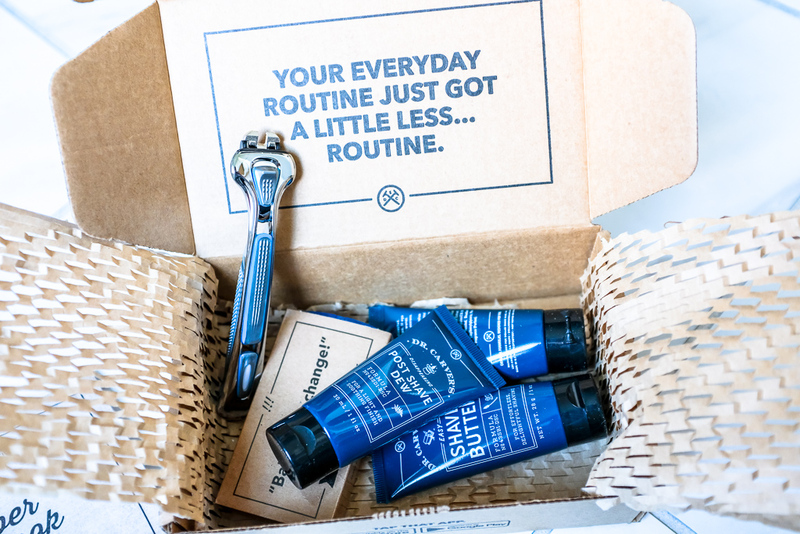 Dollar Shave Club burst onto the shaving scene with a funny, clever, and super effective video. I remember when the company went viral. At $5 for the razor, an extra cartridge, and travel sizes of the shave scrub, shave butter, and shave dew, it seemed irresponsible to not test it out. Obviously, my PayPal is now linked to Dollar Shave Club. You sign up for the subscription when you order the kit. The quality? The razor has a nice weight and feels substantial. The shave butter is a fantastic alternative to shaving cream and feels smoother. Meredith, the DSC loyalist, uses conditioner instead of the butter, which probably has the same effect! I did not get razor burn. Monthly cost: $9 for 4 replacement razor cartridges. This is a subscription service, so you don’t have to think about replacements. You can add the extras if you want. Discovered the week I had Dollar Shave Club and Flamingo orders arriving in the mail, theSkimm recommended My Billie. Fortuitous? Ironic? I felt compelled to order it to give thorough testing of the mail-order razors for women. I have to say: the color is very pretty. The magnetic dohickie that sticks to the side of the shower is cool. And the shave? Smooth. Super smooth, because it has some sort of a soap strip that makes the razor glide. The body wash (which is better than shave gel), which I considered omitting initially then splurged the extra $9 is DEFINITELY worth it. I’ve signed up for the body wash + razor subscription. Ladies, I found my razor. 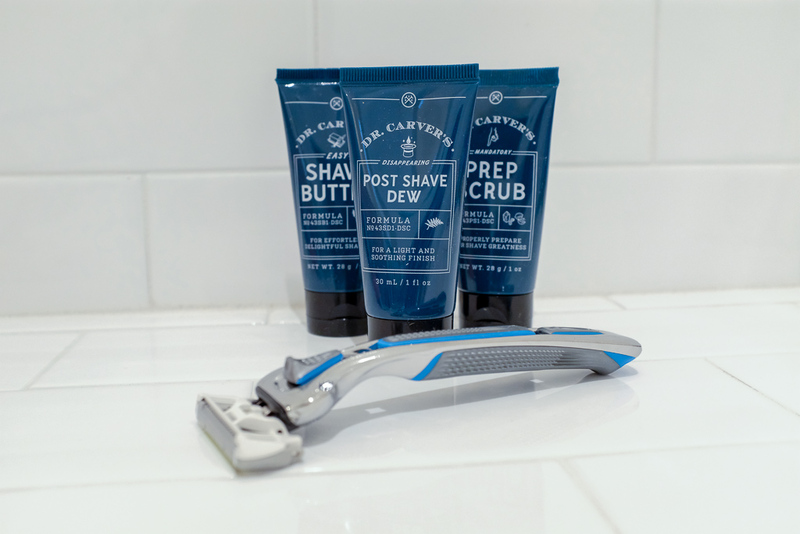 No razor is going to make shaving the best part of your morning. It will always be a chore. 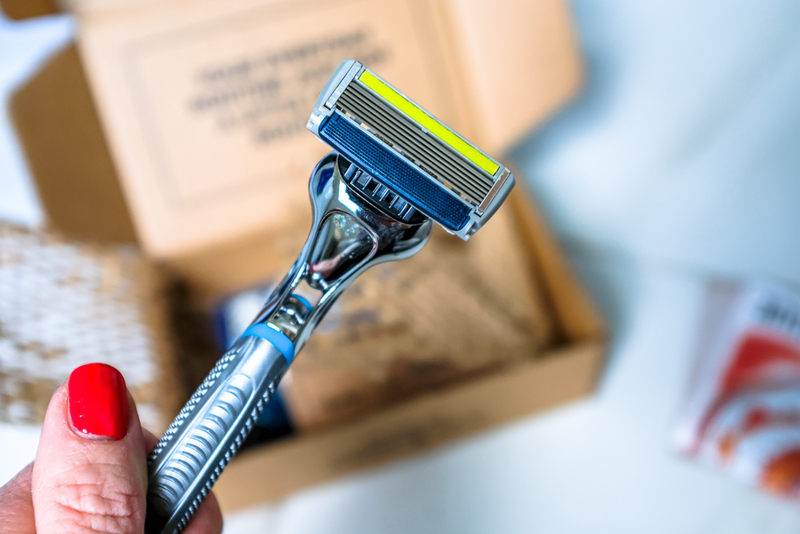 A great razor that doesn’t cause razor burn is all a girl can ask for… so, if you’re looking to take the thought out of razor repurchasing, you can’t go wrong with Dollar Shave Club. 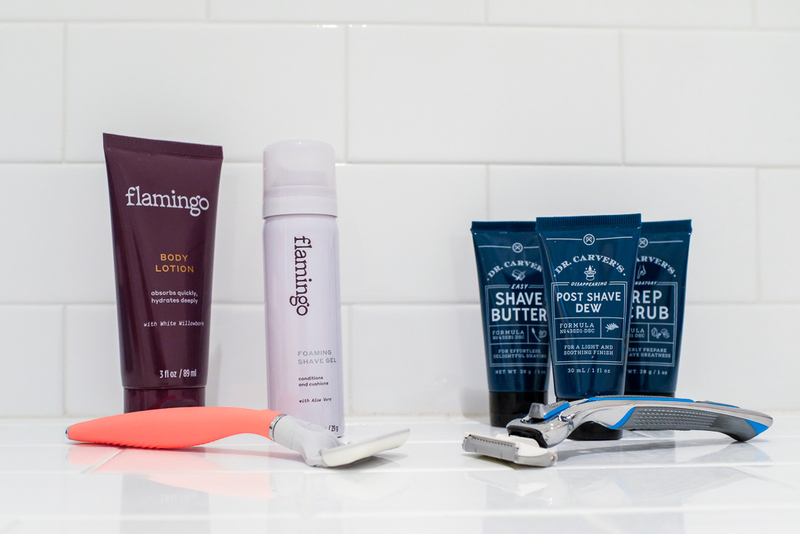 If you want a pretty razor designed for a woman, you’ll love the Flamingo. My Billie is the best of both: a fantastic razor (and it’s pretty!) designed for women with the ability to subscribe for cheap refills. Ultimately, I’ll keep using My Billie.